But let’s be honest: As much as you can tell yourself you’ll walk into “Ouija” with an open mind, it’s impossible to have high hopes about this latest “horror” film in a tiresome string of formulaic attempts. You’re not expecting Oscar-caliber performances and that’s why these kinds of films can get away with casting no one you’ve ever heard of. 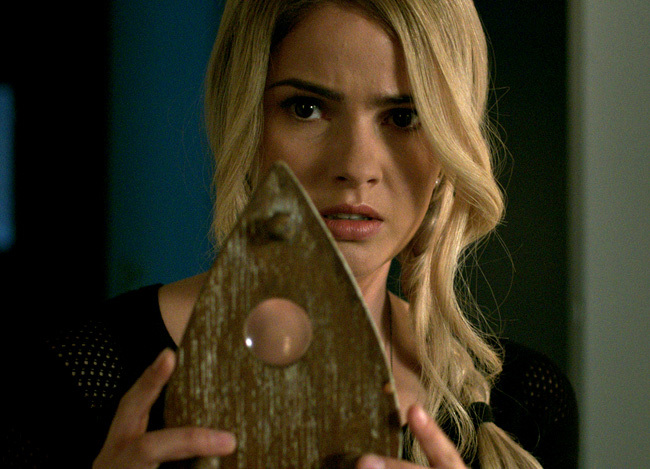 Shelley Hennig stars as Debbie in “Ouija”. This time, Olivia Cooke takes center stage. You might remember her if you saw this year’s sci-fi flop “The Signal” with Laurence Fishburne. She looks like a younger Rose Byrne. Frankly she’s literally the one thing – person or otherwise – that remotely nears something that is even somewhat passable in this major bomb of an 89-minute film. Clocking in at 85 minutes too long, this simple, formulaic, safe, riskless, going-nowhere story could have been told just in 4. In truth, 4 minutes is generous. I’ll sum it up in one paragraph that takes you 20 seconds to read. From left to right: Pete, (Douglas Smith), Sarah (Ana Coto), Laine (Olivia Cooke), Trevor (Daren Kagasoff) and Isabelle (Bianca Santos) in “Ouija”. As many films don’t dare to be original and they instead often “borrow” from others, I find accidental humor in one of this story’s most ridiculous steals. Remember the 2013 film “Mama” with Jessica Chastain from the creator of “Pan’s Labyrinth,” which, by the way, I didn’t hate and I still periodically like to whisper “mama” in a creepy voice in the middle of the night? Well, “Ouija” pretty much has the same ghostly villain, but they rename her “Mother”. With a tagline like “Keep telling yourself it’s just a game,” the film’s propaganda fails to convince you it’ll be anything but the flop it is. Translation: It literally is just a game and the film is trying too hard to make a movie of itself where none exists. Not once did I bat an eye or jump out of fear – I mean not once, and yes, I was counting – but three times I did laugh when someone next to me jumped. He felt embarrassed because he was probably afraid of meeting his in-laws or trying his new detox regimen instead of something scary that actually happened in this film. 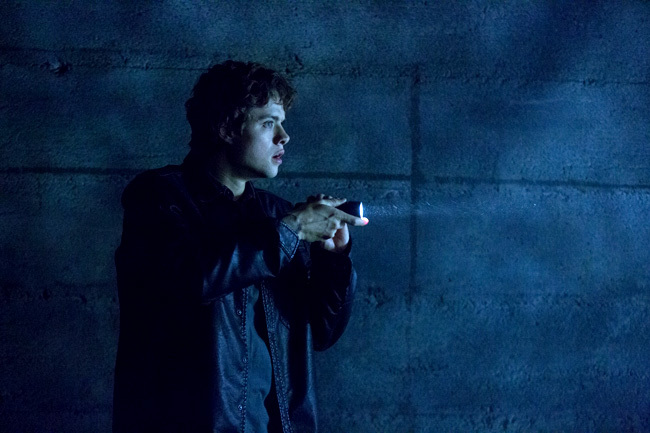 Douglas Smith as Pete in “Ouija”. Even more of a grievous offense, this film does nothing new. The aforementioned ghost reconciliation story has been Hollywood’s addiction for longer than I’ve been alive. We’ve seen eyes glaze over white when the human is taken over by a nefarious spirit. We’ve also seen the stitched-up mouth, which this film so desperately weaves into its core to attempt to instill fear. While I don’t like to point fingers, it’s time to. Unknown actors Olivia Cooke, Daren Kagasoff, Ana Coto, Douglas Smith and the brief role by Shelley Hennig aren’t to blame here. Nor is the more experienced Lin Shaye, who yet again plays the batshit crazy lady – or not? – just as she has recently in “Insidious” and “Insidious: Chapter 2”. I don’t even blame first-time director Stiles White, who has historically only worked in special effects (“The Sixth Sense,” “Jurassic Park III”). White once again wrote the failed script for “Ouija” with Juliet Snowden after they bombed writing another poor horror film together in 2012 known as “The Possession”. Clearly these two need to stop working together, but let’s call a spade a spade. Olivia Cooke and Daren Kagasoff in “Ouija”. While we typically think of actors or writers/directors as the cause for a film’s implosion, “Ouija” – and so many horror films like this recently – fails because of its producers. The list is long and includes Snowden, but I blame the influence of Michael Bay and Brian Goldner – who critics love to pan for “Transformers” – and Jason Blum. Blum’s Blumhouse Productions has been a part of nearly every horror film of late. With 74 producer credits to his name and being involved in all of the “Paranormal Activity,” “The Purge,” “Sinister,” “Insidious” films and so many more, his repeat involvement is part of the reason new Hollywood horror films have nothing new. Andrew Form and Bradley Fuller are “The Texas Chainsaw Massacre,” “Friday the 13th” and “A Nightmare on Elm Street” guys. James Moran is another “Paranormal Activity” chap, Rick Osako is an “Insidious” and “Sinister” dude, Phillip Dawe is “Sinister” and “The Purge,” Couper Samuelson is “Insidious” and Bennett Schneir is a newbie from “Battleship” who doesn’t fit the rest of this mold and is thrown in for giggles. Why do I make a point of listing out these 11 producers and their credits? Because Hollywood needs to stop reusing and financing them to work together. It’s easy to recycle a cast and crew who already has a comfort together and has a history of making money at the box office. Just because it’s easy, though, doesn’t mean you should. In fact, that’s exactly what Hollywood shouldn’t do any more – starting right now. But it won’t, which is why we’re continuing to be so disappointed. “Ouija” stars Olivia Cooke, Daren Kagasoff, Ana Coto, Douglas Smith, Shelley Hennig, Sierra Heuermann and Bianca Santos from writer and director Stiles White and writer Juliet Snowden. The film is produced by Jason Blum (“Paranormal Activity,” “Insidious” and “The Purge” films), Andrew Form and Bradley Fuller (“The Texas Chainsaw Massacre”) and Michael Bay (“Transformers” films). “Ouija” opened on Oct. 24, 2014 has a running time of 89 minutes. It is rated “PG-13” for disturbing violent content, frightening horror images and thematic material.